Please meet Mr. Jim Christensen. At 75 years young, he’s still covering lots of ground! “I have always been involved with sports in my life which I think helped lead me to becoming a runner. In 1976, I moved back to Marion [Kansas] from Stafford, KS. During my time in Stafford, I was an assistant football coach for seven years, a head football coach for five years and then I also coached wrestling for ten. Obviously you like running, but what do you enjoy most about the sport? How long have you been running competitively and how many races have you ran in? “I would have to say that I have been running competitively since 1983. I started out running 1-2 races in ’83 and kept with it from there. What would you say is your greatest accomplishment in competitive running? “Being able to compete as long as I have. It gives me satisfaction and motivation to be able to run in races year after year. What is your favorite distance to run in a race? PR? 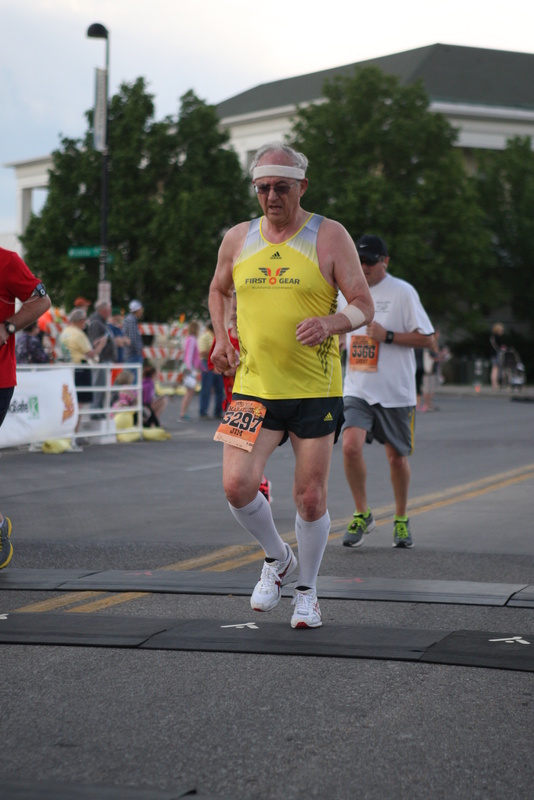 “For race distances, I really enjoy the 5K and the 4-mile. It takes a lot of recovery time for my body to run in races that are longer; therefore, I don’t do it as often. What is your favorite pre-race and/or post-race meal? What is your favorite aspect of the Prairie Fire Race Series compared to similar events? What is your goal for this year in the Fall Prairie Fire Marathon Race Series? “I want to be under 28:00 for the 5K this fall. I am recovering from a hamstring injury so we will see how it goes. What is the best piece of advice that you could give to someone wanting to take up running? “Right now my main focus is to just keep going as long as I can and take things one step at a time. At this stage it is all about taking care of your body and enjoying the ride.